Around here, Rite Aid got the jump on the other stores when it came to Halloween this year, putting out their holiday displays at the end of August. 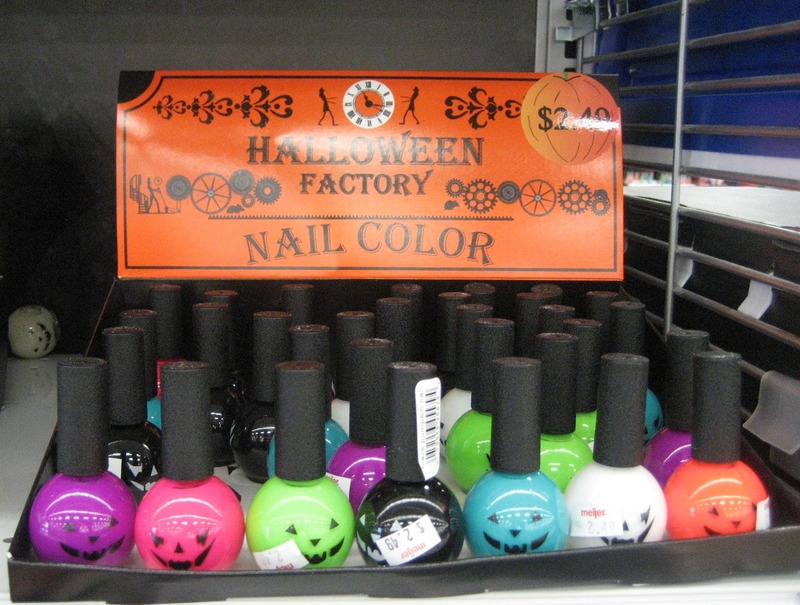 Once school started, though, other places started to catch up fast; in the last month I've seen Halloween polishes at Meijer and Walgreens and Ulta and (but not so much at CVS for some reason—maybe they're hiding their stuff in a section I don't go into). 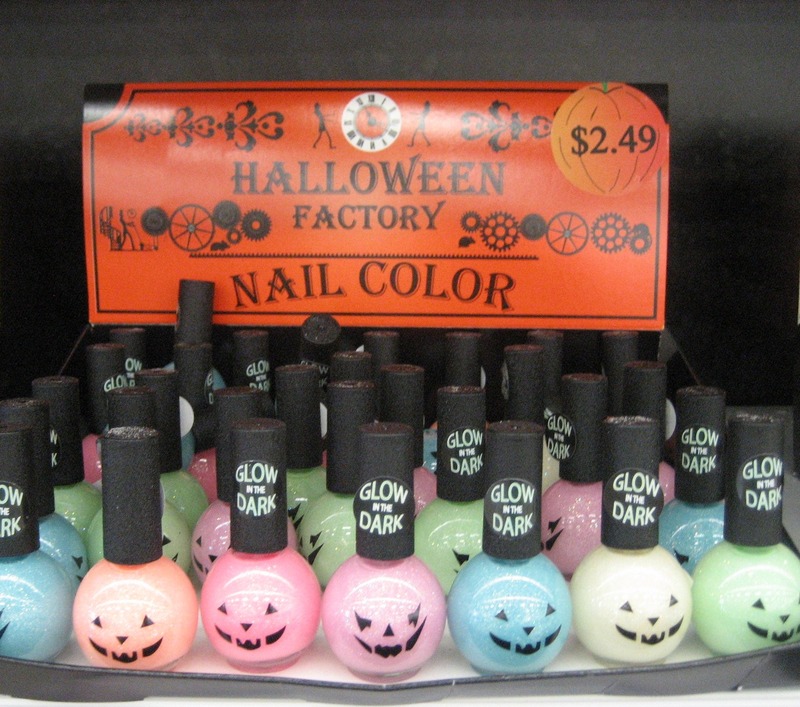 You may remember the glow-in-the-dark glitter and neon/black/white creme pumpkins from the Rite Aid displays I shared early this month. 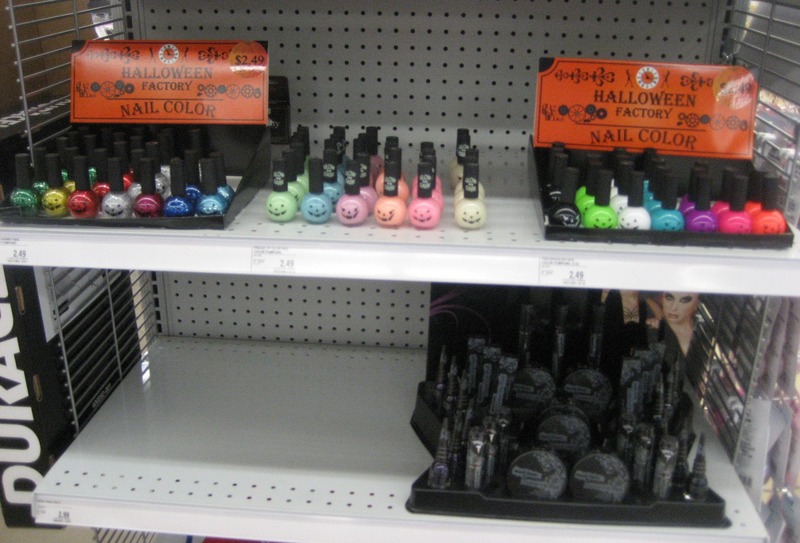 Meijer put out some of those same polishes plus more but not in those displays, just lined up in boxes on the shelf. 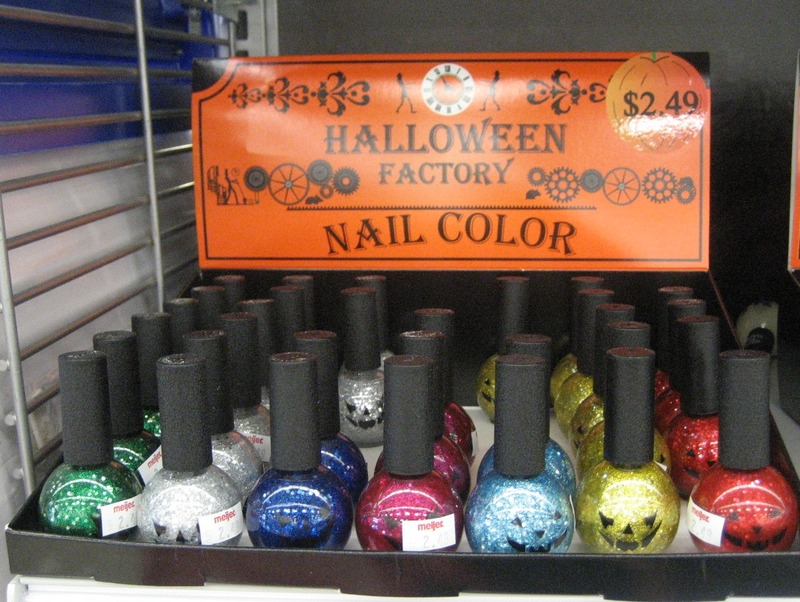 In addition to the colors that Rite Aid had, they had two more cremes (teal and lime), and seven shades of chunky glitter (these colors looked more suited to Christmas and Hanukkah but they were definitely in pumpkin bottles). They also had some of the pumpkins individually packaged. Not too far from the pumpkins was a display of glow-in-the-dark glitters called Nite Lites. BunnyMasseuse had sent me a photo of these at her Ulta a few weeks ago so I had been keeping an eye out. After I spotted them at Meijer they did show up at my Ulta as well. There are four shades of these: Pink Flamingo, Blue Moonglo, Tangelo, and Glo Worm Green. The back label on the Nite Lite ones say they're distributed by Diamond Cosmetics, Sunrise, FL; I thought the pumpkins were from Blue Cross but the label doesn't say. 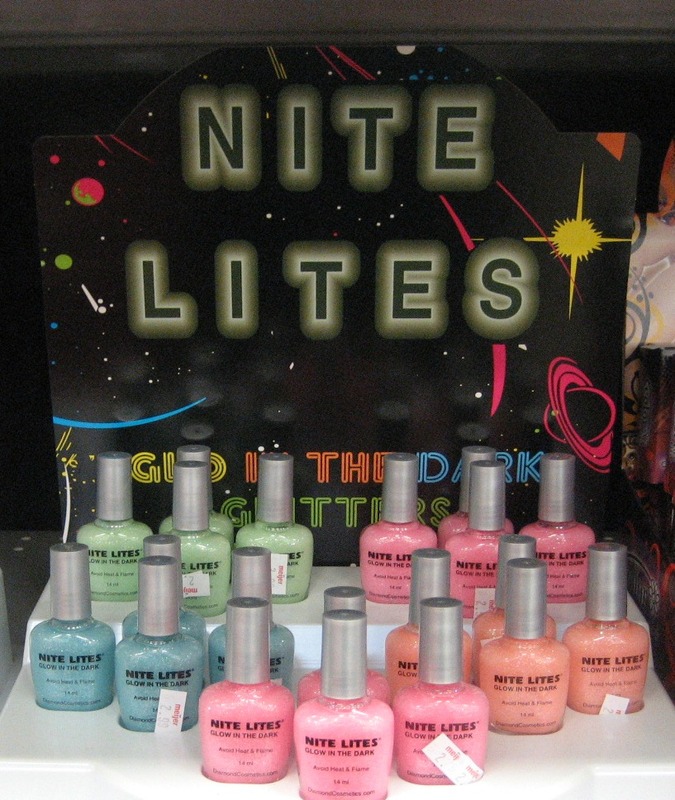 Next to the Nite Lites was a stack of Color Club sets, with four polishes and some decals. The back of the box says the polish colors are Bewitching, Charmed I'm Sure, Spellbound, and Hocus Pocus, though which is which I don't know. The glitter reminds me a lot of Magic Attraction. 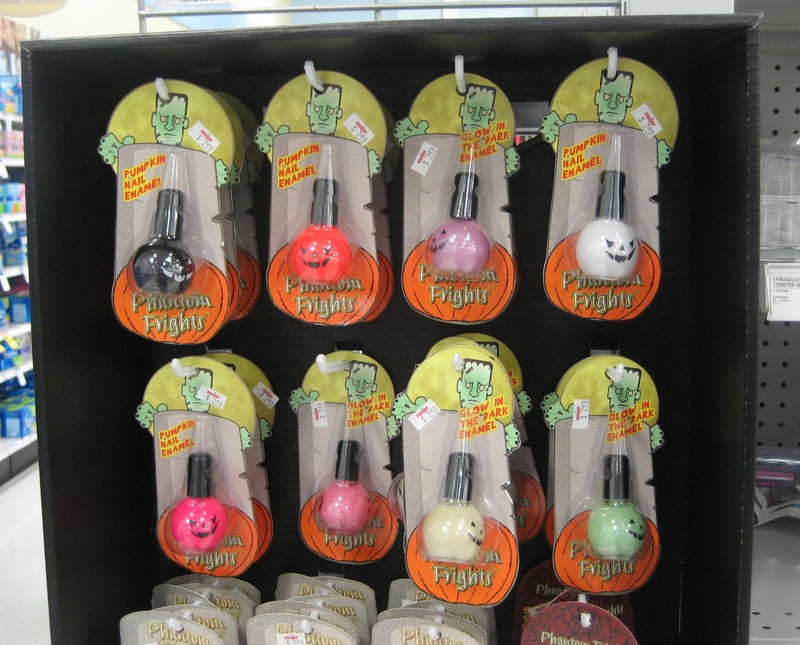 Meijer also had Claw Polish in coffin-shaped bottles; I'd seen this a week or two earlier at a local chain drugstore. The display was six slots wide but there were only five different colors; I don't know if one color was already sold out or what. 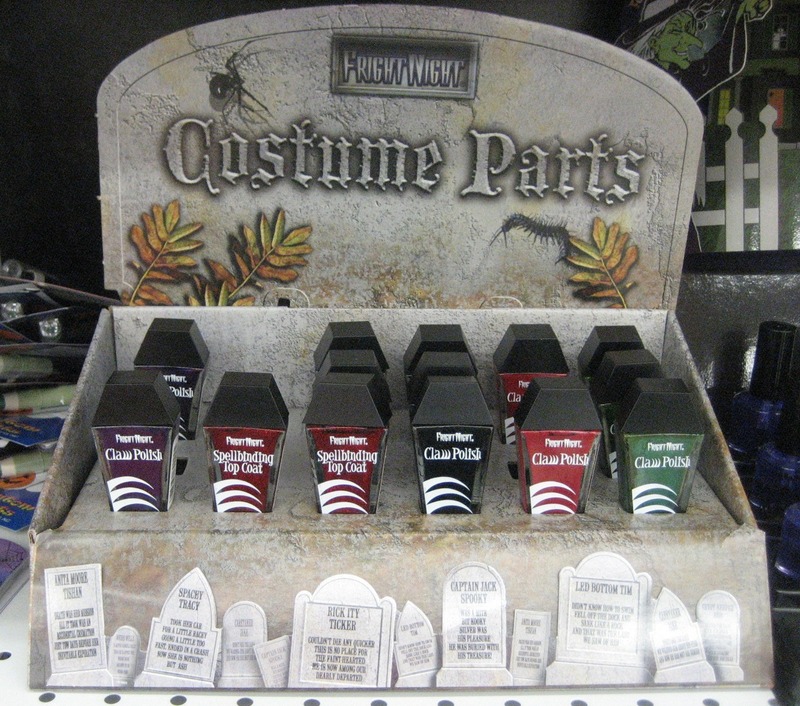 The ones that were there were Poison (purple), VooDoo (red glitter), Sinister (black), Bloodshed (red creme), and Toxic (green). On a bottom shelf at a different Meijer, I found a Manic Panic display. Because it was out in a main aisle very near the greeter at the front door, I was trying to be more stealthy about my picture taking, so I didn't get a great shot of. Look in the gloom at the bottom right of the shot to catch a glimpse. 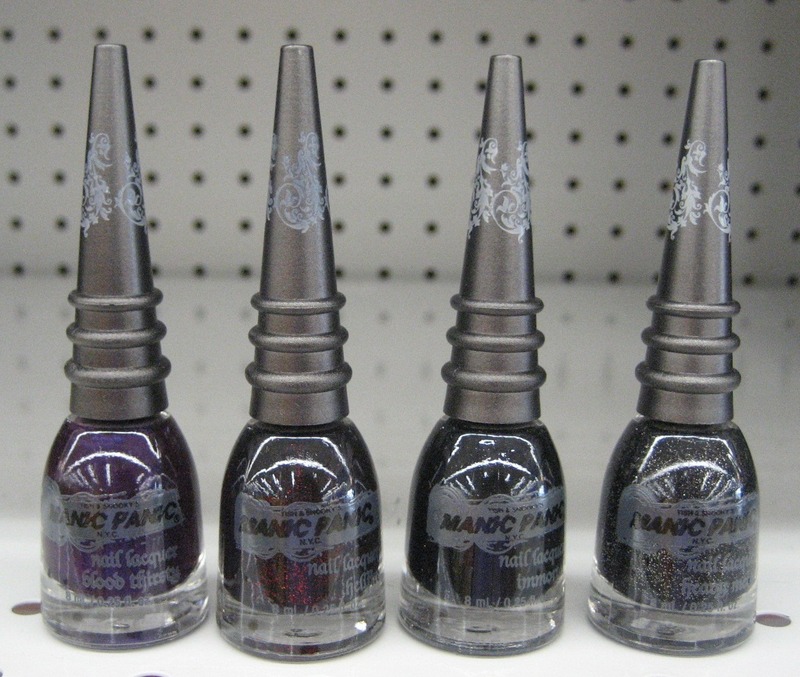 There were four polishes in the display, in witchy-looking pointed cap bottles. I didn't manage to get the shade names on these. Front section, left to right: Chiffon, Poseidon, Debutante, Crush, Citrus, Disco Darling. Back section, left to right: Red Velvet, Wine & Dine, Sugar Plum, Sangria, Talon, Black Tie. These were 6.99 for 17ml (.58 oz. 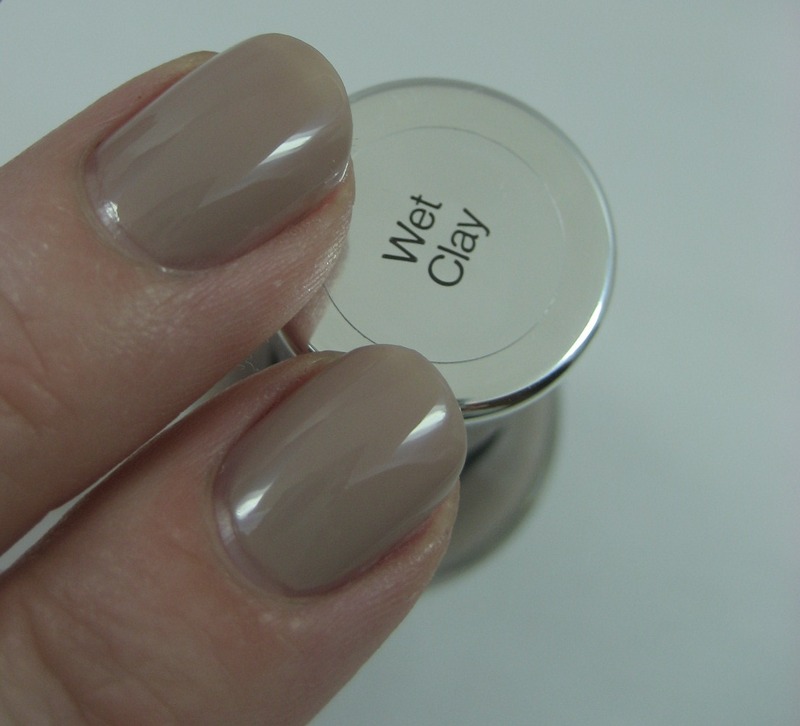 ), which puts them in about the same price class as Orly and Sally Hansen Complete Salon. I know what I'm getting with Orly and SH, but I don't know Nox, so I didn't get any of these. I did think the metal emblem on the back of the bottles was interesting (or maybe that was the front and the ones in the display were backwards); I don't have anything like it in my stash. 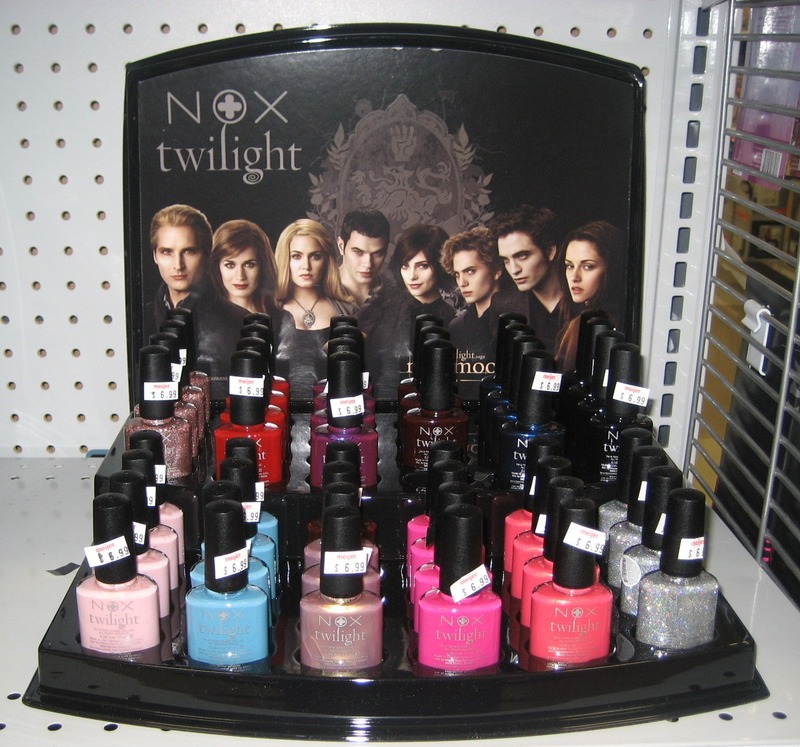 I don't understand what a lot of the Nox colors have to do with Twilight. If they'd asked me, I would have told them they needed an amber (like Edward's eyes) and a forest green (for all the trees around Forks) and a grey (for the overcast and rainy days that make it possible for the vamps to be out and about). 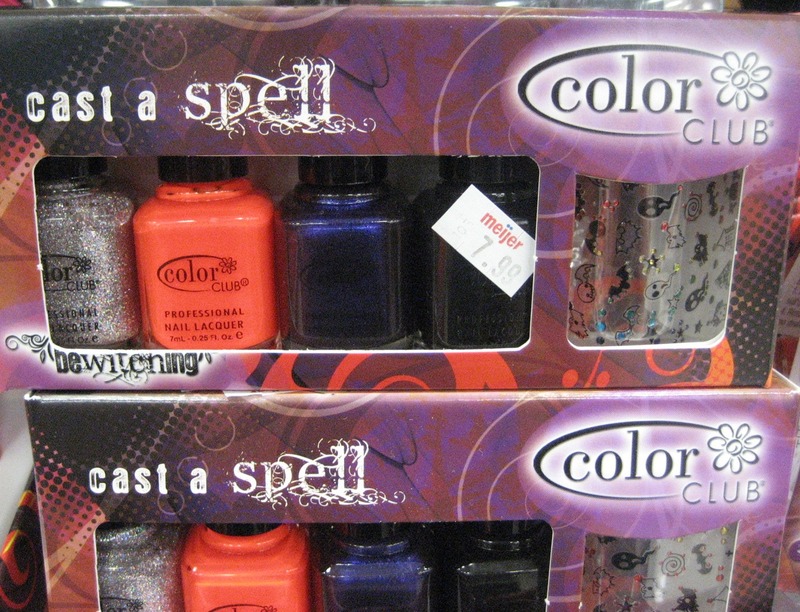 What colors say "sparkly emo vampire" to you? I hadn't worn a neutral in a while, so American Apparel Factory Grey seemed like a good choice. I got this in a swap with Smita. It only took two coats and wore well for the few days I had it on. 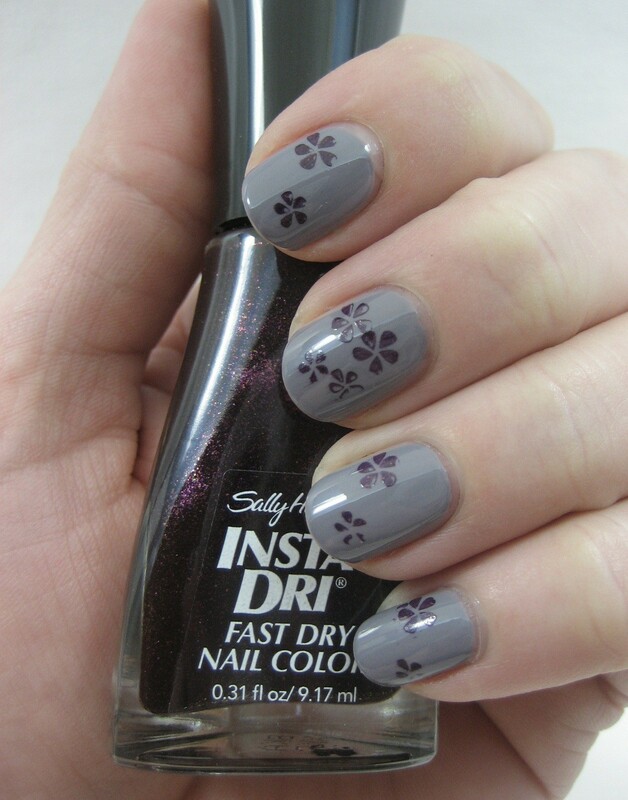 Before I took it off, I tried stamping it with Sally Hansen Insta Dri Uptempo Plum and Konad plate m3. I had some trouble getting the images to fully transfer, but hey, flowers in nature aren't always perfect, either, so I was okay with it. I double stamped my middle finger just to see if could do it without overlapping the flowers (I almost managed). 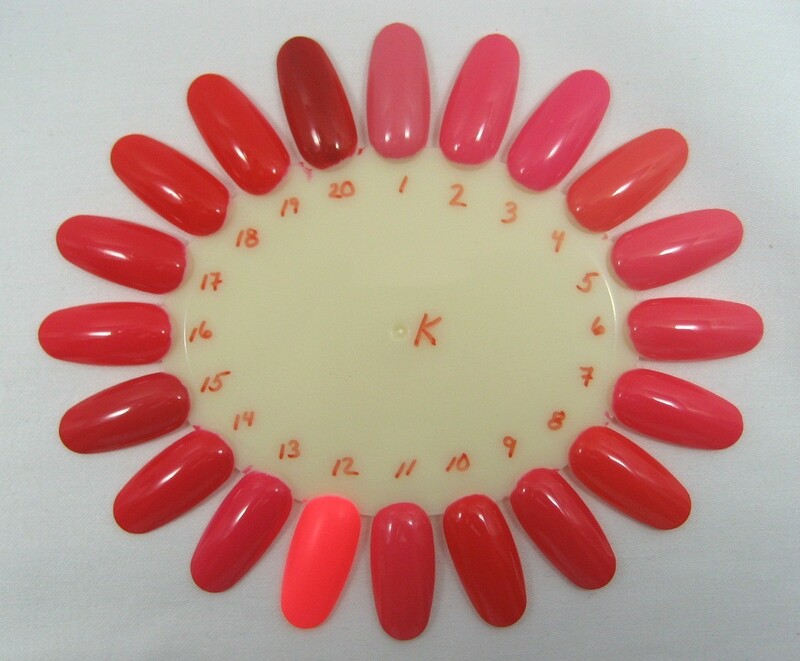 As often happens on Nail Wheel Wednesday, not all of the polishes on the wheel exactly fit the title. Swatching sure isn't an exact science, at least not when I do it. Walgreens had a sale on Sally Hansen polish last week, so I went to a few stores hoping to find the Fall 2010 Complete Salons I'd only seen at Meijer at full price up to that point. (The ones I took in-store bottles pics of for this entry.) I struck out until Saturday night, by which point the store I found them in had started to switch over to the next week's sale. The clerk at the counter said no, they were ringing up at full price now, so I left them there and went to a different store, but they didn't have the new display. Since Mr. Karen was off having guy time and wouldn't be wondering how a quick trip to the drugstore was taking over an hour, I decided to go back to the other store with my serious sad I-can't-believe-you-won't-honor-this-ad face and was fortunate to find a different clerk who rang me up at the sale price. Score! Let's start with the glitters, since those are the most eye catching. All of these have a clear base, and while they are fairly dense with glitter, I still had some visible nail line after three thin coats. I don't mind that because it means they should be great for layering. The three glitters are Golden Ticket, a coppery gold, Starry Starry Flight, a silver, and Downtown Rubies, a red. The next group I have is the neutrals, which I at first thought were all cremes, but no, one has some shimmer to it. 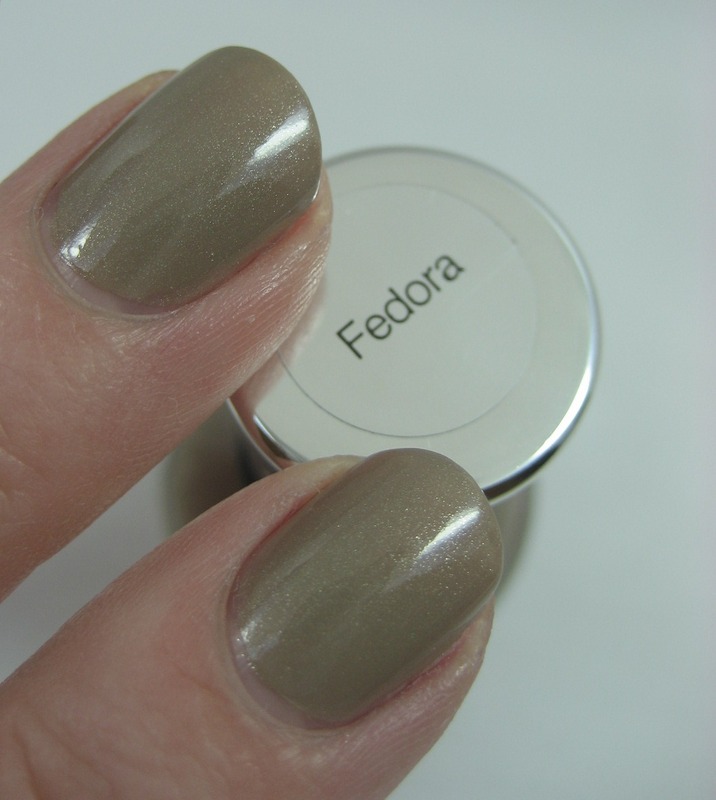 The lightest ones, Evening Fog and Wet Clay, took three coats while the others, Fedora (the shimmer) and Touch of Mink and Bittersweet, took only two. Finally, we've come to the two dark and mysterious shimmers, the olive green Sequin Scandal and the plum Problem Child, both of which have mini-flakies in them. 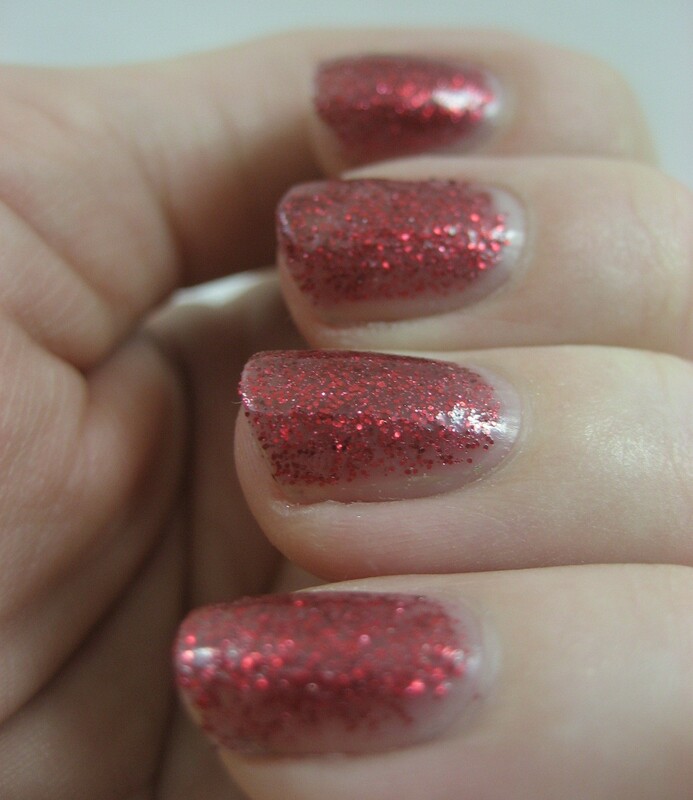 I used three coats of Sequin Scandal and two of Problem Child; I think I was just so fascinated by Sequin Scandal that I had trouble putting the brush down. I'm quite happy with these. 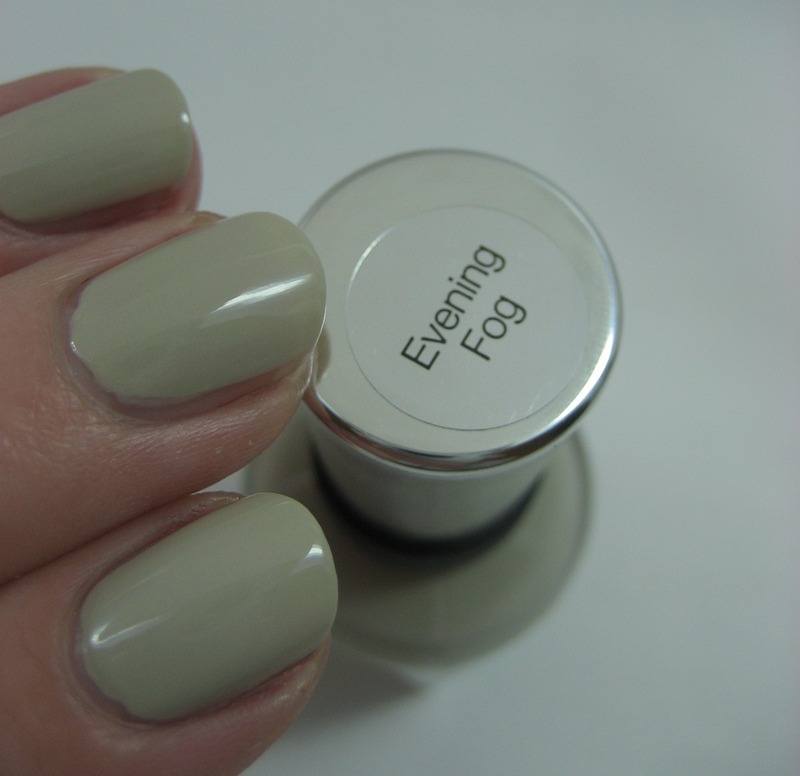 Undoubtedly some of them are dupes of other polishes but they went on so nicely I can't be cross with them. (I think I'm finally getting used to working that weird wide brush and stem.) I'm looking forward to playing more with the glitters and I will probably do some comparisons at some point because I really can't keep increasing my stash and de-duping is the least painful way to reduce it. When I ordered the khakis, I also got the two shades Chanel released to celebrate the re-opening of the Soho Store, Steel and Strong. 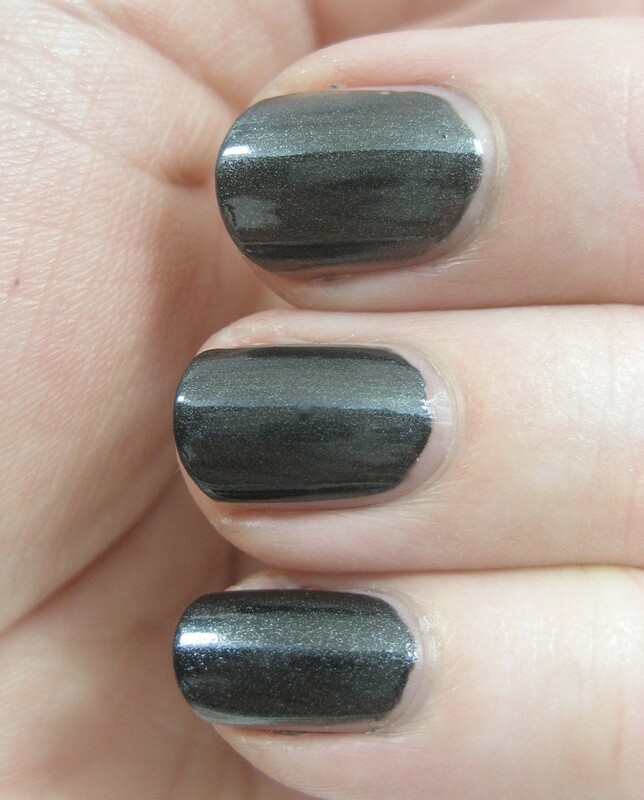 Steel is a charcoal grey shimmer. 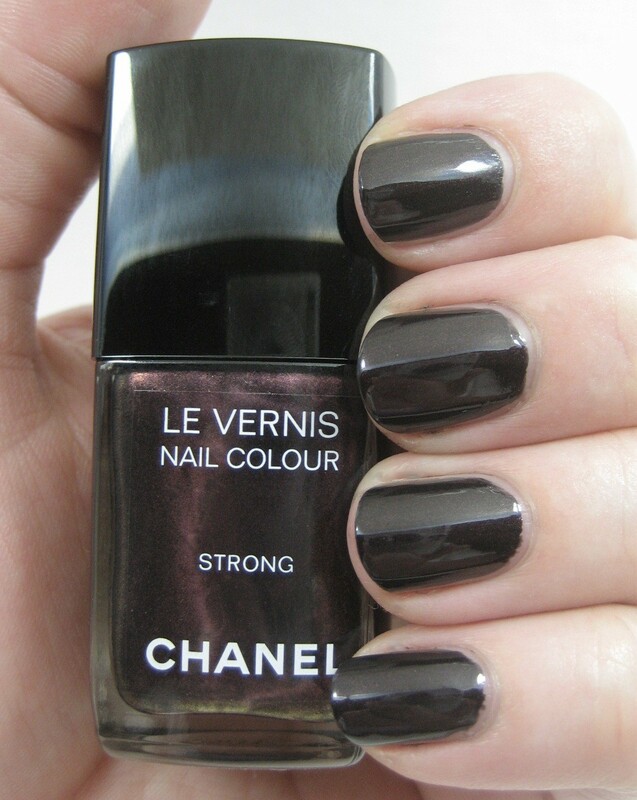 The polish in the bottle I got was rather thick, not the easy to apply goodness I've come to expect from Chanel. 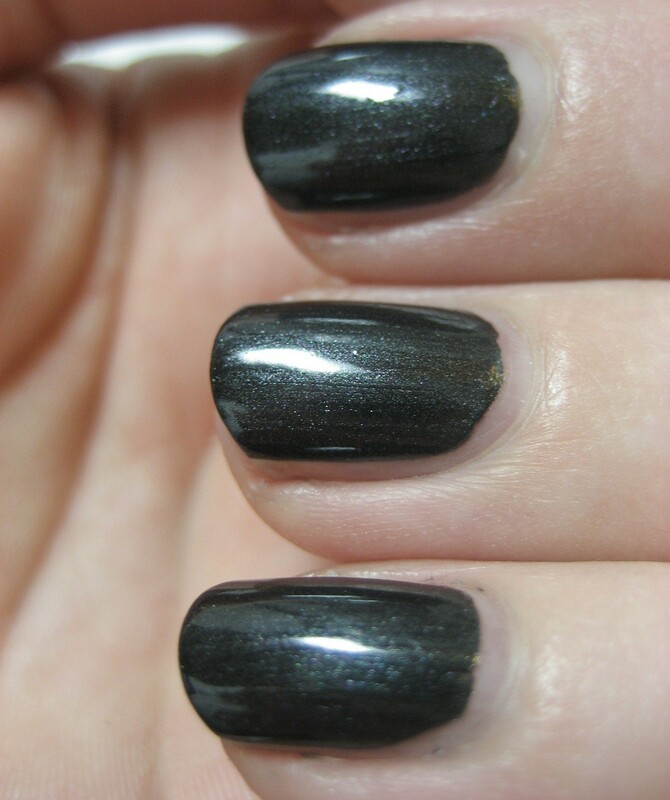 I used two coats, though I might have been able to stop at one if I'd been more careful applying it. I was decidedly underwhelmed by Steel indoors, so took it out in the sun to see if it would look better in bright light. It didn't, not really. The shimmer did show up better, and I caught some sparks of blue I hadn't seen inside, but it still did not enchant me. Looking through my blacks, whites, and greys drawer, I found a couple much cheaper polishes to compare to Steel. 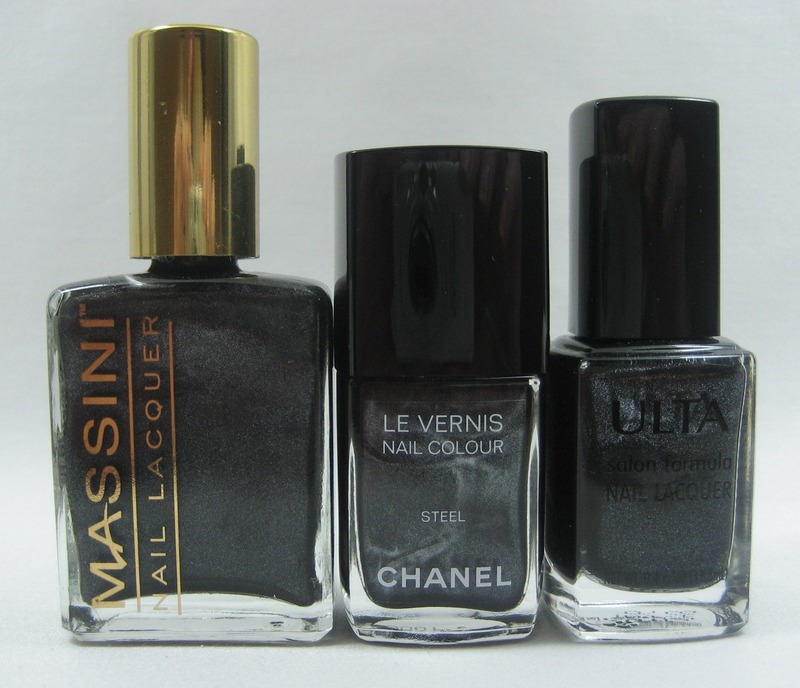 Left to right: Massini After Hours, Chanel Steel, Ulta Salon Little Black Dress. Top to bottom: After Hours, Steel, Little Black Dress. The Massini and the Ulta are less subtle shimmers than the Chanel, so they're not dupes, but the look is similar enough for me. 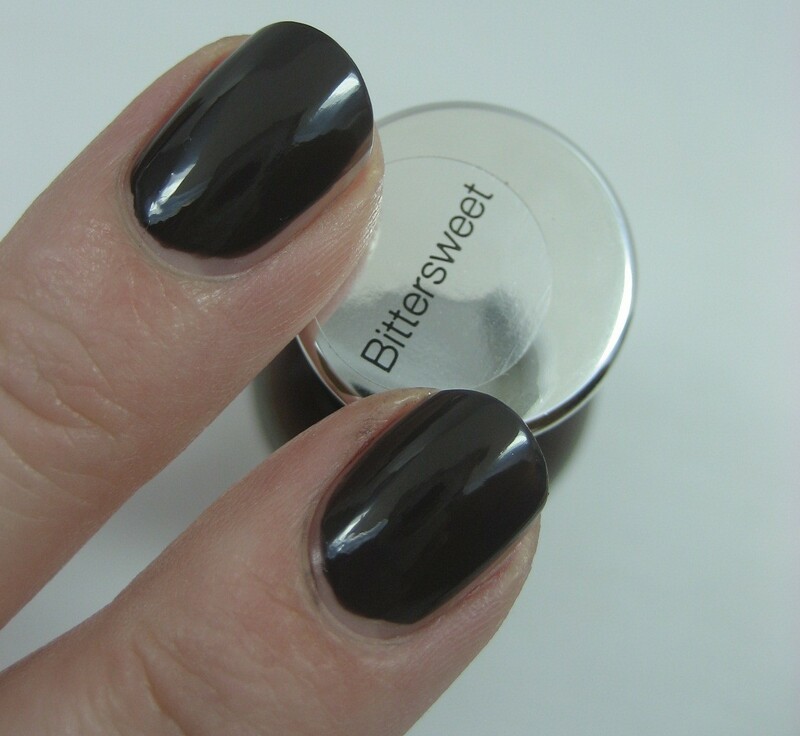 Strong is a deep brownish plum shimmer. Really deep, like almost black. Unfortunately, I didn't get any good shots of Strong in the sun. Like Steel, its shimmer was more visible in the brighter light, but it wasn't anything dramatic. Of course I did a comparison. 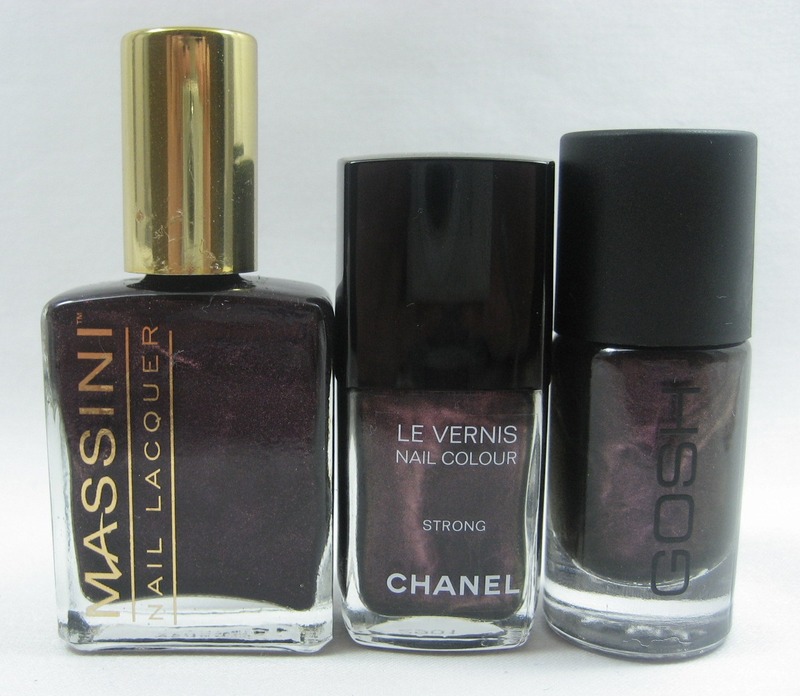 Left to right: Massini Catwalk Queen, Chanel Strong, GOSH Mystery Night. 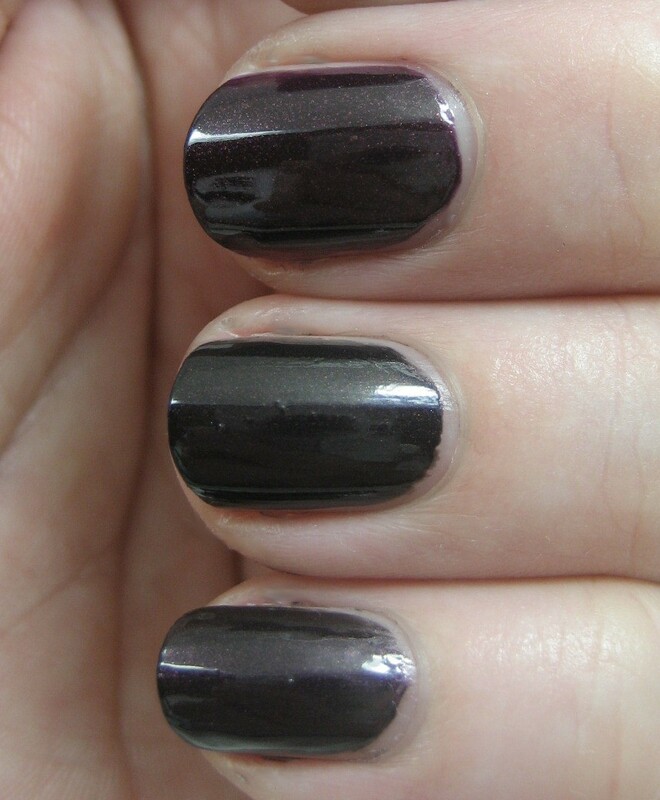 Top to bottom (indoors): Catwalk Queen, Strong, Mystery Night. Top to bottom (outdoors): Catwalk Queen, Strong, Mystery Night. 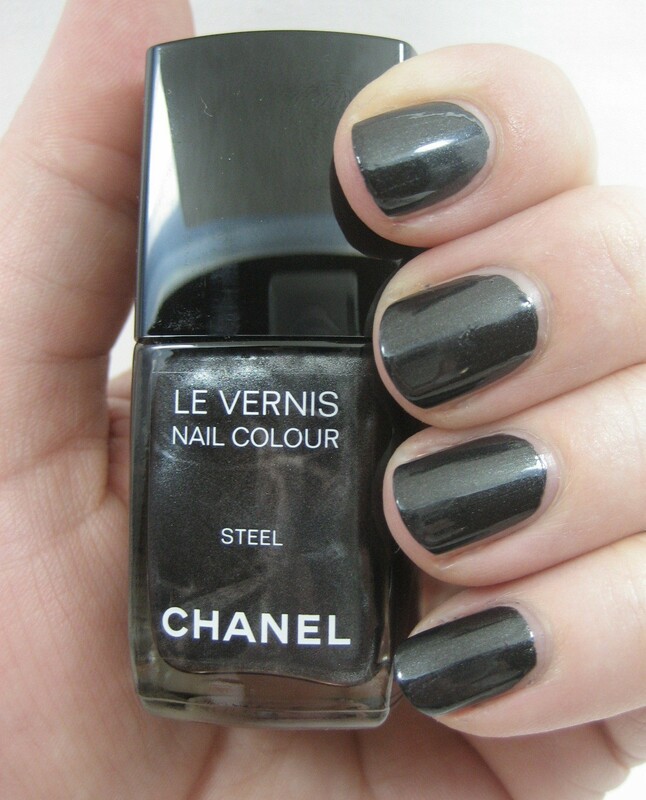 No dupes here, either; the Chanel is my least favorite of the three. I'm thinking these Chanels might be headed for my swap box (or that blog sale I keep thinking I'll get around to having one of these months). They're just not that special to my eyes. 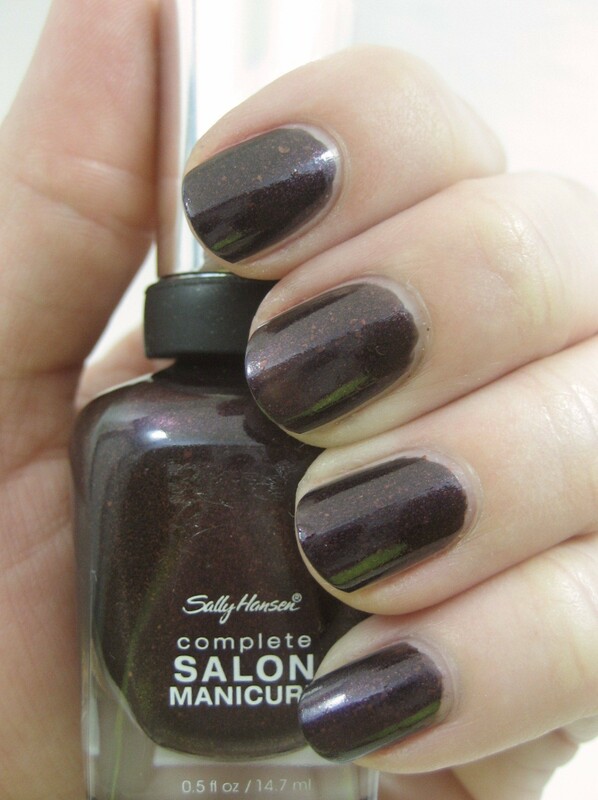 After taking off Louise and shortening my nails a bit (peelies, oh how I hate you), I went with a more conservative purple look: Sally Hansen Salon in Purple Heart. 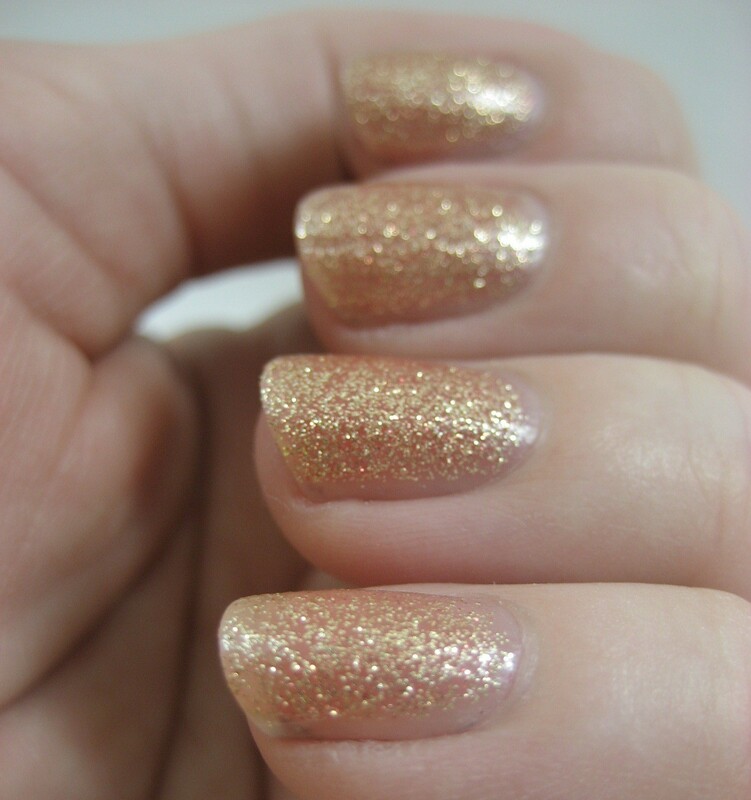 This polish was part of the Canadian exclusive Project Runway collection; I was fortunate to get it in my swap with Halifax from Sparkled Beauty. 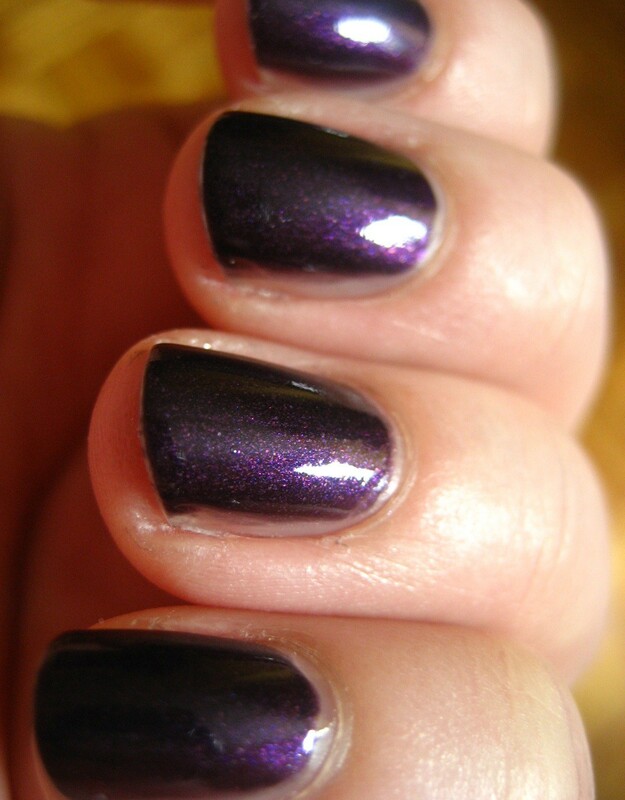 It's a lovely deep purple shimmer. The sun decided to put in an an appearance shortly after I put this polish on, so I can show you the pink and blue shimmer that appears in this one in very strong light. 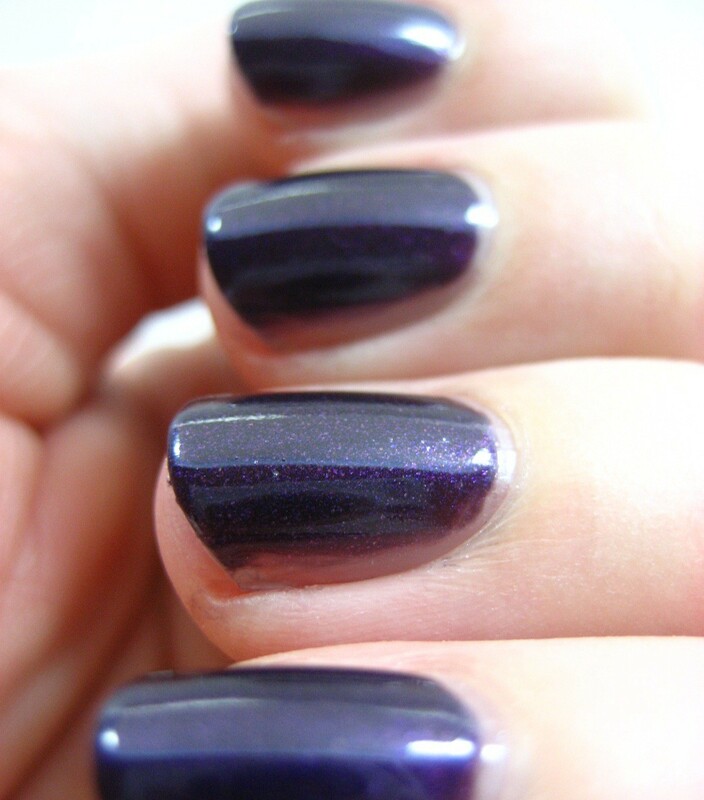 I think this one is very pretty, though I am admittedly biased toward purples. More non-U.S. goodies today, this time from amused Polish who was kind enough to swap with me again even though I've had not one but two packages sent to her in previous swaps go astray (though the replacements did make it, it's just my successful delivery rate is way, way lower for Austria than any other place for some reason). Left to right: P2 Color Victim Vibrant, P2 Crackling Top Coat Black Explosion, Isadora Grafitti Nails Masterpiece Pink, P2 Energetic Blue, Isadora Grafitti Nails Subway Green, P2 Crackling Top Coat Silver Blast, P2 Color Victim Trouble. 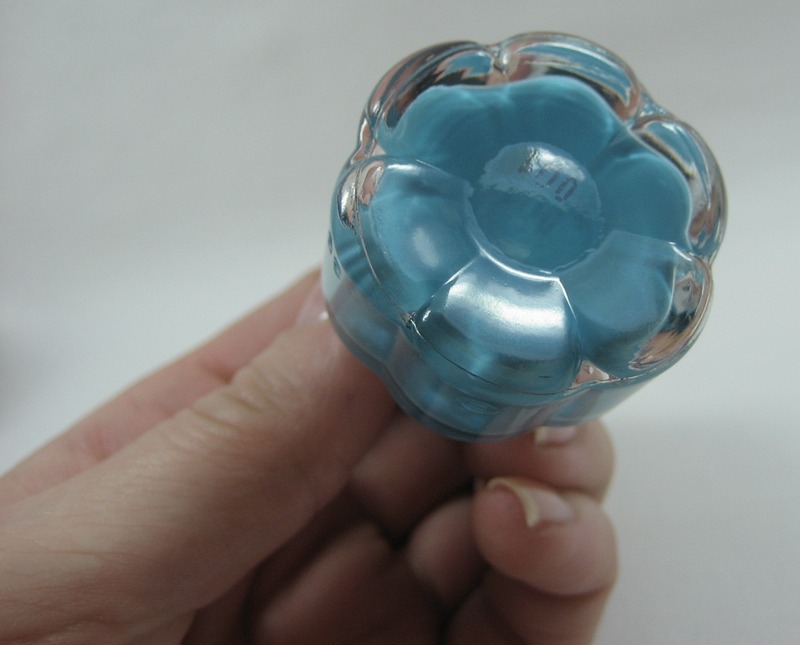 The blue in the center is in the cutest bottle; pick it up and there's a flower! It was very hard to decide which of these to try first. 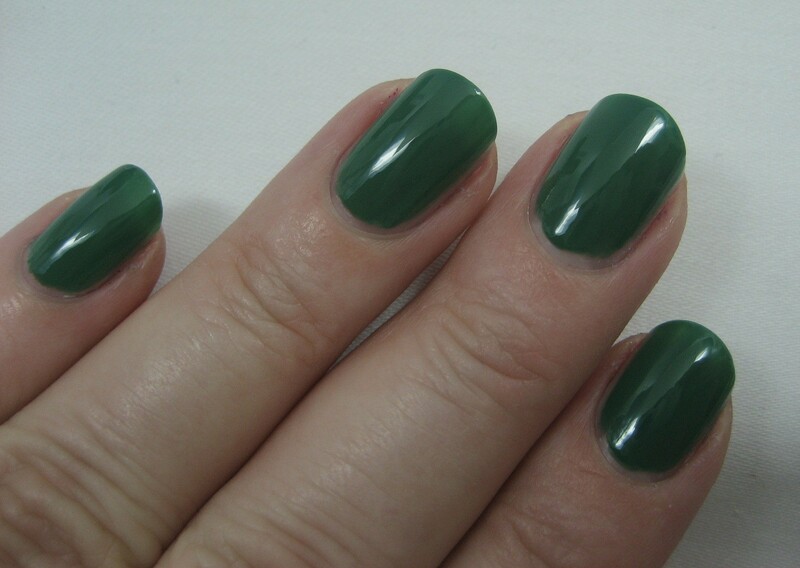 I settled on Vibrant, a green creme that reminds me of OPI Jade is the New Black. It applied like a dream and only needed two coats. Pretty as Vibrant was on its own, you know that with so many crackle options at my fingertips I was not going to be able to leave it alone. 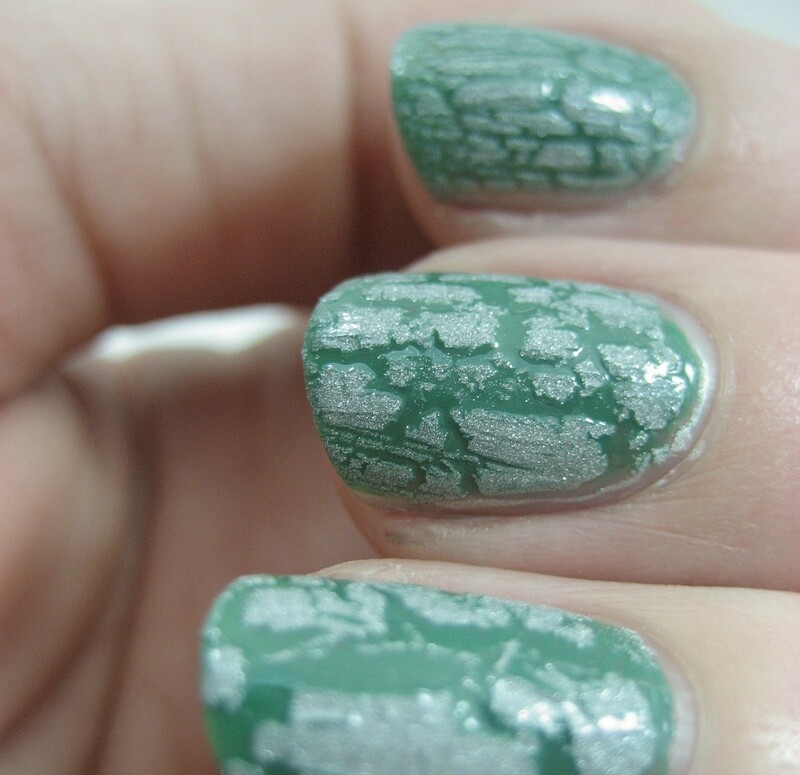 I used one coat of the shimmery P2 Silver Blast over the almost dry green and it sure did crack. I had such fun watching it transform. 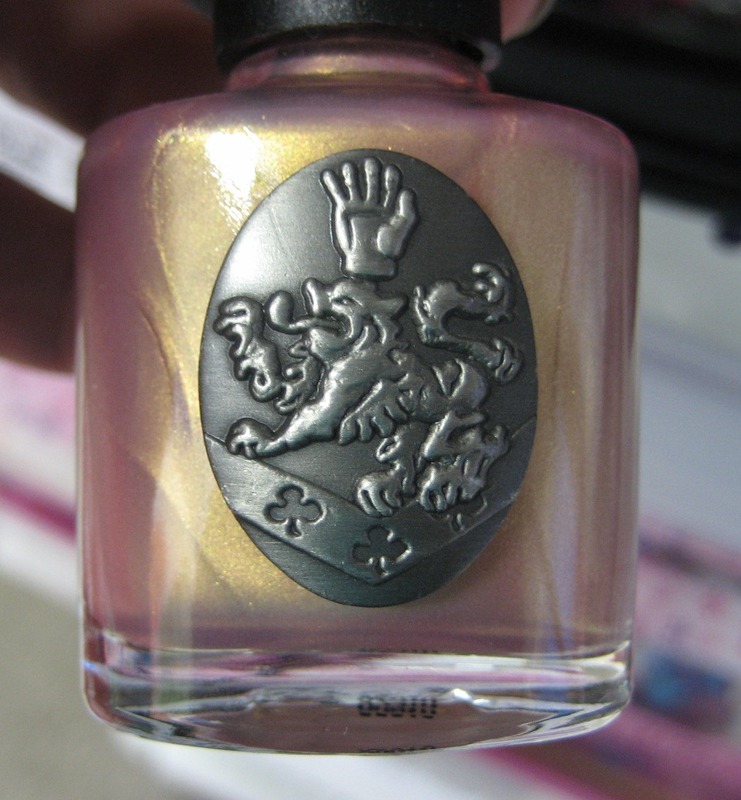 When it seemed to have stopped cracking, I put some top coat on to shine it up and smooth it out just a bit. I hope the resurgence of crackling top coats in other countries means U.S. brands will bring them back soon, because they're a lot fun. 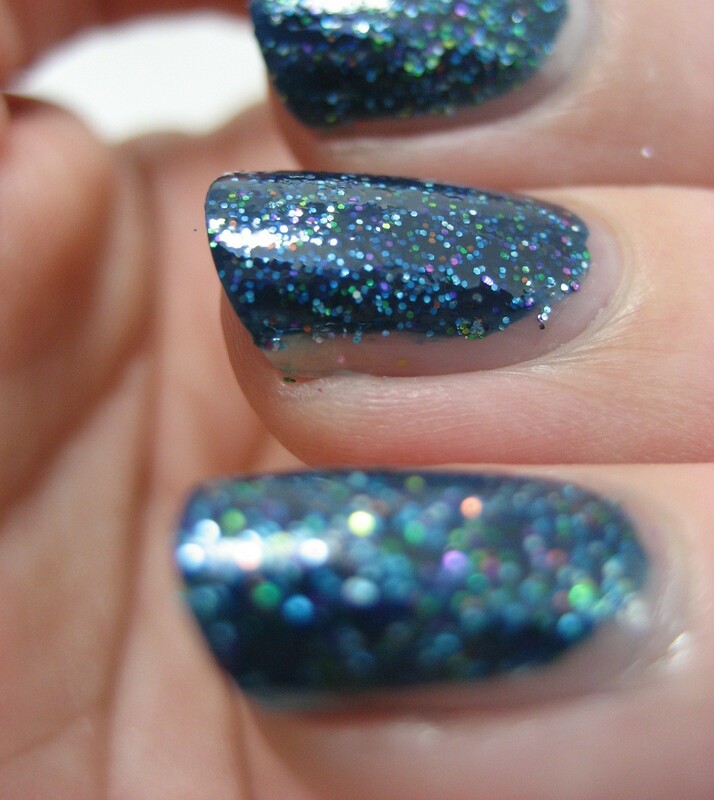 When I shared my Purple Confetti NOTD, I mentioned I'd gone back and bought some of the other colors from the Scintillare collection, and today I have swatches of those, starting with Mediterraneo Sea, Purple Confetti's blue twin. 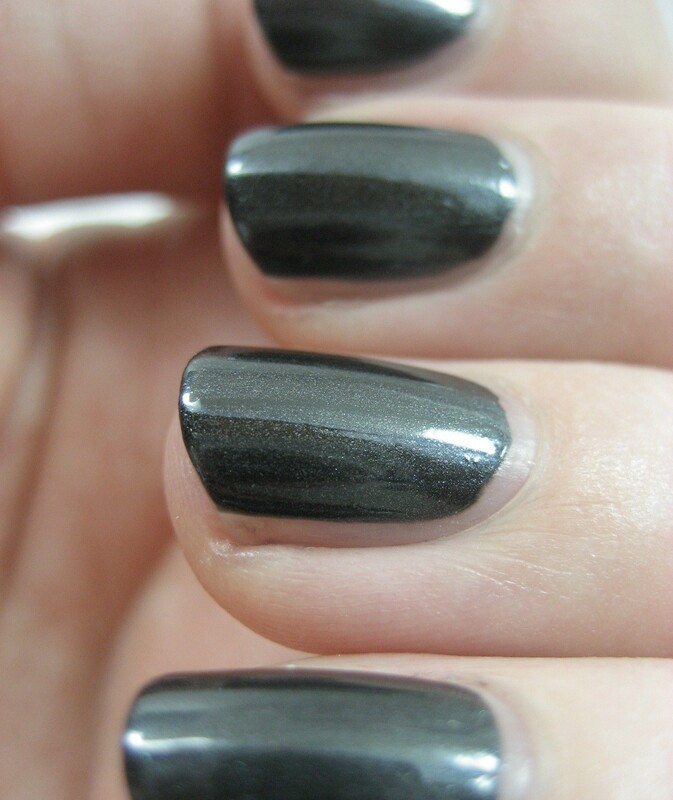 Like its twin, without top coat, it's matte. And bumpy, thanks to the glitter. Two coats are plenty. With top coat, it's sparkly. 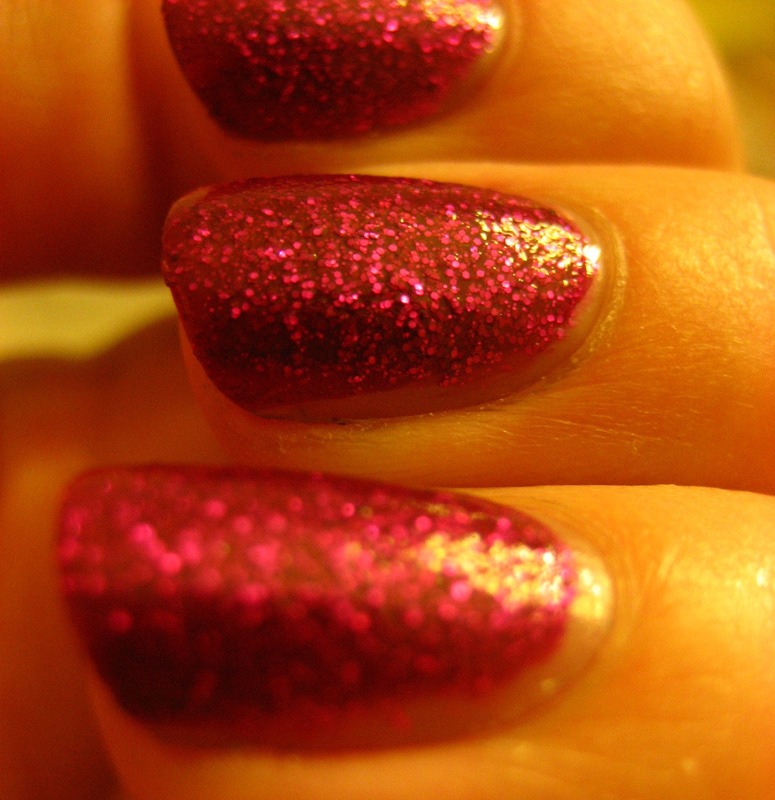 Vignetto Berry has a deep raspberry base with brighter raspberry glitter. 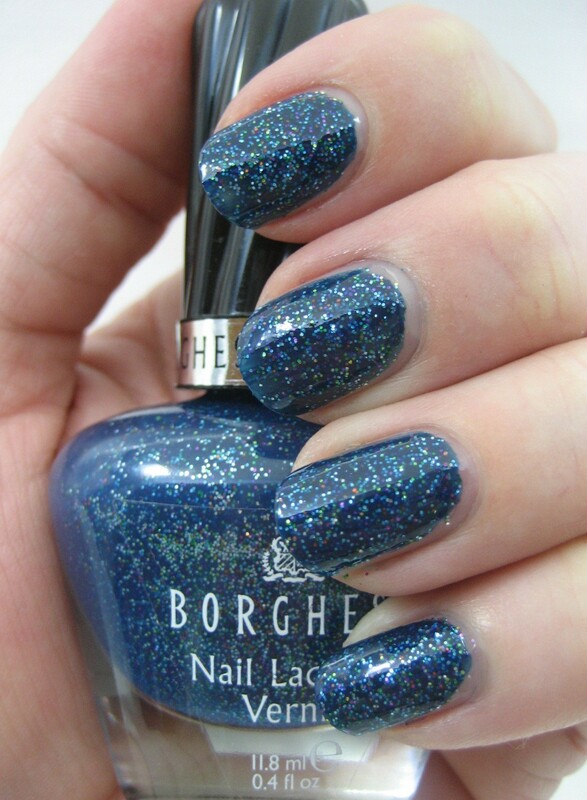 Unlike Purple Confetti and Mediterraneo Sea, the glitter is all one color, but since the base is not transparent, it covers the glitter to varying degrees, which lends a very nice sense of depth to this on the nail. Like the others, it's a two coater, and dries matte when left to its own devices. 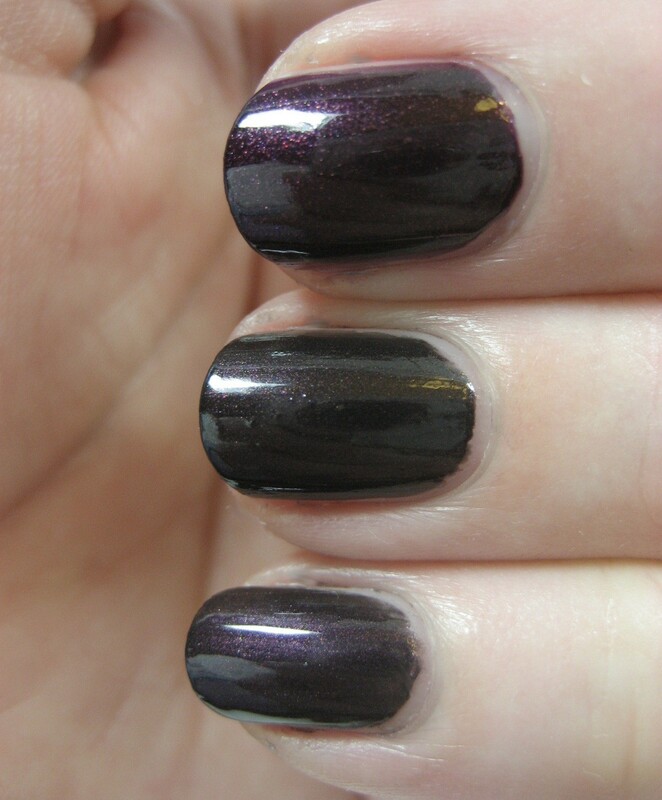 I didn't like this one as much as the multi-colored ones until I added top coat, which helped bring out its charms. I'm including a low-light shot of this one, as it's very glowy even when not in direct light. 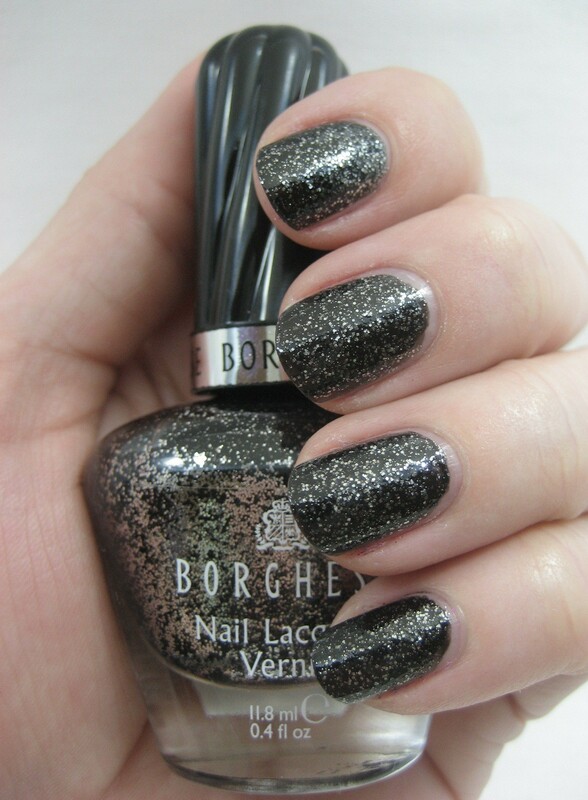 The last one I have is Nero Magico, a black base with silver glitter. I used three coats of this one. 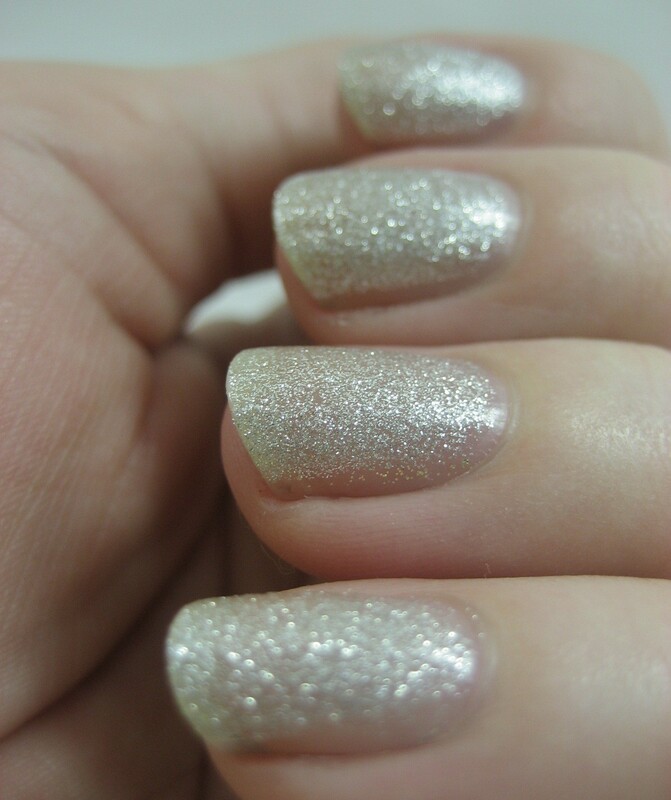 It didn't seem nearly as matte as the other, maybe because the glitter itself is so blingy. 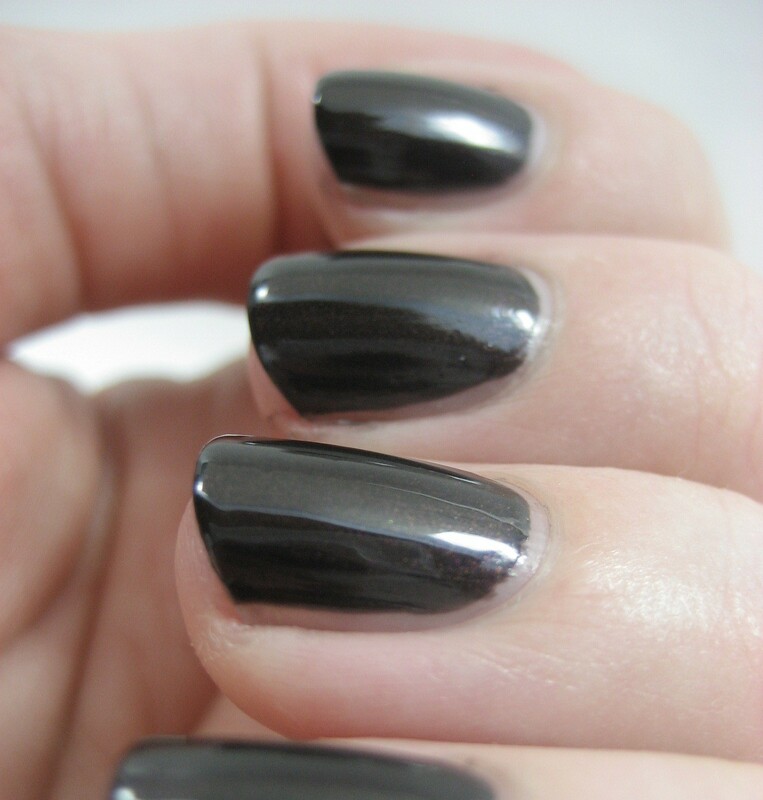 The first picture below is without top coat, the second one is with it. There are two more in this collection, a red and a gold, which I left in the display, but with Rite Aid having a BOGO sale right now I might yet pick those up. I'd read that these might be the same as two of last year's holiday minis, but then I read that they weren't, so perhaps it's a good idea to get them just to do a comparison. Oh yes, I can rationalize just about any nail polish purchase.